On August 14, 1999, the final section of the 16-kilometre long Oresund Bridge connecting Denmark and Sweden – the world’s longest single bridge carrying both road and railway traffic – was put in position by a floating crane. Then in a simple ceremony six hours later, Crown Princess Victoria of Sweden and Crown Prince Frederik of Denmark met at the halfway point of the bridge to mark the historic re-linking of the two countries some 7,000 years since they were last joined as a landlocked mass before the end of the Ice Age. The project opened to traffic in the summer of 2000. 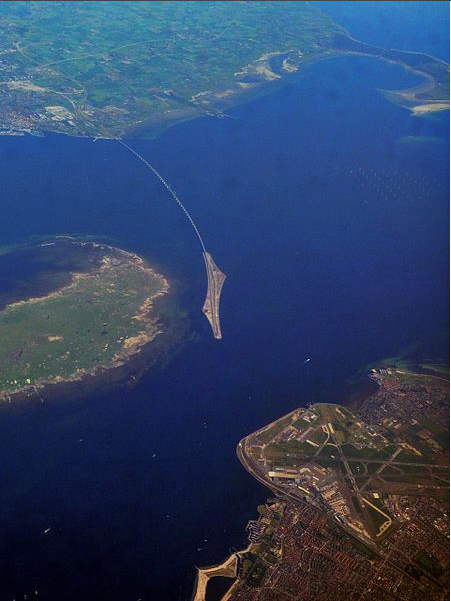 The design for the bridge that would link the two countries across the Oresund was completed in 1994 after the agreement to build it was signed in 1991 and ratified by the parliaments of both countries. The design took full advantage of repetition by composing the major part of the bridge of identical spans. The high bridge, with its record cable-stayed span of 490 metres, is designed to harmonize structurally and aesthetically with the design of the eastern and western approach bridges. 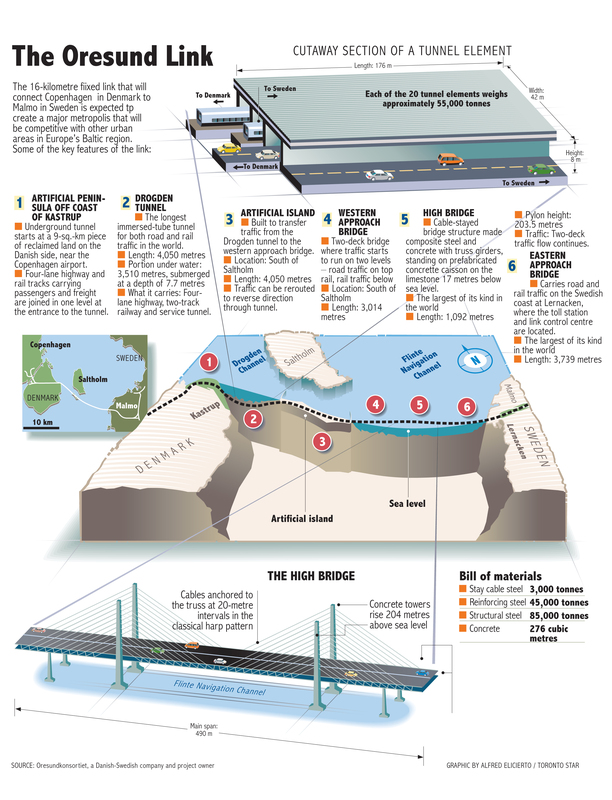 It is made of composite steel and concrete, with truss girders standing on prefabricated concrete caisson on the limestone 17 metres below sea level. The bridge was completed in just two and a half years. The 4,050-metre tunnel running 7.7 metres deep under the Drogden Channel is the world’s longest immersed-tube tunnel for both road and rail traffic. Linking Copenhagen in Denmark to Malmo in Sweden was expected to create a major metropolis that would be competitive with other urban centres in Europe’s Baltic region. Today, the link handles an estimated 8 million vehicles a year, or roughly 60,000 travelers daily, and another 8 million passengers a year on the two train tracks. Graphic by Alfred Elicierto. Published in the Toronto Star in 2000.